Recommendation: If you like reading the darker-side of any mythology, it’s a definite pick. The famous mythology made humanoid casting light on all the society evils giving the entire story a new point of view. 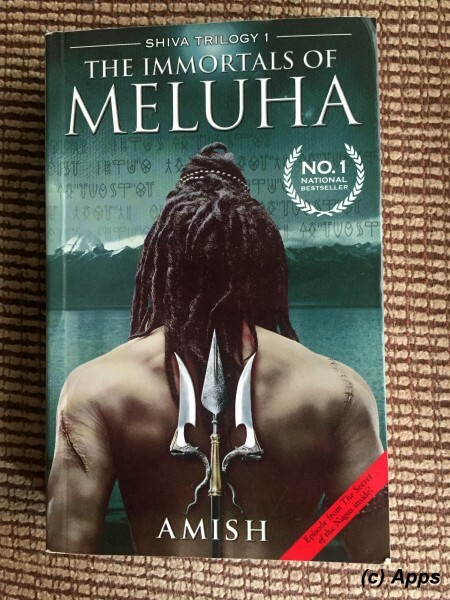 The Immortals of Meluha is the first book in the Shiva Trilogy written by Amish Tripathi and published in February of 2010. The plot is set in the land of Meluha and revolves around the people of Meluha, their king Daksha, Shiva - Chief of Guna Tribe and the fight of Meluhans against the Chandravanshis and the Nagas. Shiva, Chief of the Guna tribe is invited by King Dakhsa - ruler of Meluha - to aid them in their fight against the Chandravanshis from the neighboring land Swadweep and the Nagas and also in trying to save their primary river Saraswati - their life force. During their visit Shiva's tribe falls sick. However when Ayurvati - Chief of Medicine of the Meluhans - gives the medicine to Shiva his throat turns blue while the rest heal. Per the legend the Meluhans believe that a warrior with a blue neck will be their savior. Seeing Shiva's neck turn blue they declare him as Neelakanth - their savior. Thus starts the interesting journey for Shiva in the land of Meluha and beyond. During his stay at Devagiri, capital of Meluha, he meets Sati - daughter of King Daksha - and falls for her. But his advances are rejected by Sati because she is a Vikarma - an untouchable due to sins of her past lives. He also meets Brahaspati - Chief inventor of the Meluhans - and forges a friendship for life. Through whom he finds out the legendary Somras which is manufactured using the water of Saraswati. Somras is the actual life source for the Meluhans and hence the panic around the decreasing levels of Saraswati River. In the midst of all this the Meluhans are attacked by the Nagas. Now it lands up on Shiva's shoulder to gather the forces, working along-side Devagiri Chief Minister Kanakhla and the Head of Meluhan Army, Parvateshwar - to fight the Nagas and the Chandravanshis. Will Shiva and Sati get married? Who are these Nagas? Why are they outcasted? Will River Saraswati be saved? What is the motive behind the Chadravanshis to keep attacking the Meluhans always? Now that Shiva is Neelakantha, what is his destiny? Will he accept it? Author Amish has cleverly used the actual mythology to weave within the humanoid characters and simultaneously bringing into light the society evils and human weaknesses - Vikarma (abolishing someone because of the so called sins of past life), Nagas (outcasted because of deformities), Somras (a medicinal drink that could have been used for more better use). A well written book that I enjoyed reading it thoroughly. Different from the normal kind of books I read so it took a little time to get into it. But once I got in, I couldn’t put the book down. Enjoy the read.